Demand for flash memory has outstripped supply for major manufacturers, and the reason once again is said to be the popularity of Apple devices like the iPhone and iPod touch. Demand for flash in the third quarter of 2009 exceeded supply by an estimated 1.3 percent, according to data from DRAMeXchange, as relayed by DigiTimes. That deficit is expected to grow to 3.3 percent during the coming holiday season, as manufacturers continue to favor Apple with their supply. "Taiwan-based memory module houses are moving to diversify their NAND flash suppliers to minimize procurement risk, according to industry sources," the report said. "NAND flash supply has reportedly become tighter as major chip producers Samsung Electronics, Toshiba, Micron and Hynix Semiconductor favor demand for Apple devices." While many module makers in Taiwan currently depend on Samsung for their flash memory supply, they are now likely to look elsewhere due to an expected shortage. The report suggests that IM Flash could get most of the new business. Samsung is reportedly planning to launch two memory cards under its own brand, which has led people in the industry to believe that chip supply will not meet demand through November. Demand for flash is expected to grow 81 percent in 2010, based on the growth of smartphone sales. Manufacturers are predicted to be able to meet that demand for the first half of the year. 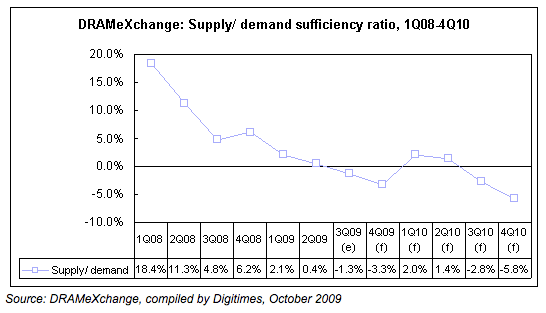 However, by the end of 2010, DRAMeXchange expects demand to again outstrip supply. It estimates that supply will grow 79 percent next year, falling behind the growth in demand. As demand has grown before the coming holiday season, so, too, have prices associated with NAND flash. "Contract prices for mainstream 16GB and 32GB MLC NAND flash chips rose 7-8% and 8-14%, respectively, to average US$4.98 and US$7.68 in the first half of October, according to DRAMeXchange data," the report said. "The 64GB segment also saw a price rally of 6-13% to US$14.50 on average." Those prices are higher than in September, when a 16GB chip was $4.48, and 32GB cost $6.80. At that time, it was also reported that there was a "serious shortage" of NAND flash memory due to the popularity of Apple products. Manufacturers said they intended to limit the supply of memory to all companies other than Apple. In September, Apple announced a number of new flash-based iPod offerings, including a 64GB iPod touch, its largest capacity flash-based player yet. It also introduced a new iPod nano that shoots video. It offers 8GB or 16GB of storage.